Lightning or thunder is a blinding light in the sky which usually occurs during the rainy season, followed by a thundering sound called thunder. Lightning is a natural phenomena that could be analogous to the large capacitor, which consists of the first layer of clouds (can be charged negative or positive) and the second layer of the earth (neutral). Capacitors are passive electrical components that can store energy for a moment. 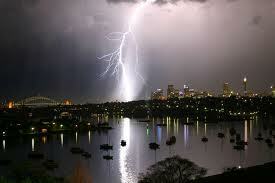 Lightning is caused by electrons from the clouds above the roof of the building, then induced a positive charge. Thunderstorms can occur because there is the potential difference between cloud and ground or cloud to cloud a different charge. Charge cloud occurs because clouds move on a regular basis and interacting with other clouds, so the negative charges gather at the top or bottom of the cloud and positive charge on the reverse side. If the potential difference between the cloud and the earth is large, then disposal of electrons occurs in order to be balanced. Electrons are discharged through the air. When the electrons can penetrate the insulating air boundary then an explosion of sound. Thunderstorms frequently occur during the rainy season because the air contains a higher water content, so that the insulation down and current flows easier. There is a cloud of negative charged and there is a positive, then the lightning can happen between clouds of different charge.